This book is the culmination of 40 years of teaching, from my beginning as a graduate from Christchurch Teachers College, New Zealand, to an active retirement as a workshop presenter of workshops on teaching and learning in North America, the Caribbean,Asia and Europe. Of course, no one is born a teacher. Some claim there are personality characteristics and behavioral traits that may help, and excellent role models and mentors can help. More to the point of this book, is the fact that a group of practical skills can greatly enhance your teaching. My expertise came from a unique opportunity. I was appointed as an inspector of schools, which meant I watched others teach and students learn. From these observations, I prepared reports on the quality of teaching and learning. That was a daunting task but after nine years and having watched an estimated 9,000 lessons in classrooms I was able to put this experience to work. In the next 11 years I taught and worked with teachers and students at Lincoln University in the South Island of New Zealand. The ideas in this book are not newly found. They are my collection of the simple and complex ideas that make up the skills of an expert teacher. By “expert,” I mean someone who can still identify with the struggles of novice learners and beginning teachers. As a working thesis for best practice, I believe that it is possible for all who want to learn, to do so. Success is a matter of choosing the ways that best suit your learning. In a similar vein, all who appreciate and enjoy other people can become effective teachers. There is nothing more rewarding than to see the glimmer of understanding-the “Ahas”-in your students. To see these more often, we have to become learners ourselves and follow French physiologist, Henri Foubert’s dictum: “To teach is to learn – twice.” When we understand something well enough to teach it, we can claim to really know it. None of these strategies (each one fits on a page) will meet the learning needs of all your students, or any student, all the time. The diversity in student preferences for learning is an important dimension of teaching, and should be respected. The research into modal preferences in the two books, “How do I learn best? A student’s guide to improved learning” and, “Teaching and Learning Styles: VARK Strategies”, clearly indicates that there are no universals on how students learn. 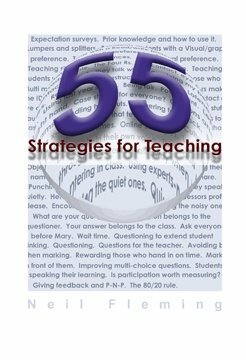 Use the techniques in this book and watch how your students react. Some will enjoy them; others will not. Only students know how they learn. It is not necessary to read this book from cover to cover. If there is a theme, it is – teaching has to be about learning- otherwise, there is only talking. Beginning teachers are invited to turn the pages and find items that are within their capability and that suit their circumstances. Those who are more experienced can fine-tune their skills by reading some pages and adjusting already excellent skills to reach even more students. No single page will make a huge difference, but the skills on many pages have the potential to make better teachers. Select at least 10 strategies that you would like to purchase from the following list. Each strategy costs $0.50 NZD. Your selection will be collated into a PDF that you can then download. Why do they talk when I am doing my best stuff?